The magnificent Alhambra Palace in Granada. The name Alhambra comes from an Arabic root which means "red or crimson castle", perhaps due to the hue of the towers and walls that surround the entire hill of La Sabica which by starlight is silver but by sunlight is transformed into gold. But there is another more poetic version, evoked by the Moslem analysts who speak of the construction of the Alhambra fortress "by the light of torches", the reflections of which gave the walls their particular coloration. 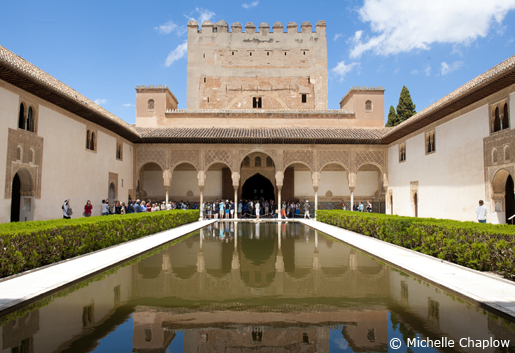 Created originally for military purposes, the Alhambra was an "alcazaba" (fortress), an "alcázar" (palace) and a small "medina" (city), all in one. This triple character helps to explain many distinctive features of the monument. There is no reference to the Alhambra as being a residence of kings until the 13th century, even though the fortress had existed since the 9th century. The first kings of Granada, the Zirites, had their castles and palaces on the hill of the Albaicin, and nothing remains of them. The Nasrites were probably the emirs who built the Alhambra, starting in 1238. The founder of the dynasty, Muhammed Al-Ahmar, began with the restoration of the old fortress. His work was completed by his son Muhammed II, whose immediate successors continued with the repairs. The construction of the palaces (called Casa Real Vieja, "old Royal House or Palace") dates back to the 14th century and is the work of two great kings: Yusuf I and Muhammed V. To the first we owe, among others, the "Cuarto de Comares" (Chamber of Comares), the "Puerta de la Justicia" (Gate of Justice), the Baths and some towers. His son, Muhammed V, completed the beautification of the palaces with the "Cuarto de los Leones" (Chamber of the Lions), as well as other rooms and fortifications. El Patio de los Arrayanes. The Alhambra became a Christian court in 1492 when the Catholic Monarchs (Ferdinand and Isabel) conquered the city of Granada. Later, various structures were built for prominent civilians also military garrisons, a church and a Franciscan monastery. Emperor Charles V, who spent several months in Granada, began the construction of the palace which bears his name and made some alterations to the interior buildings. 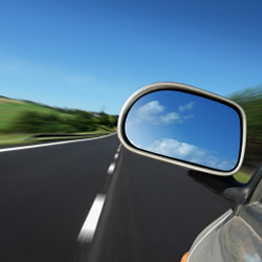 These measures were to cause interminable controversy often motivated by political agendas. The remaining Austrian kings did not forget the monument and have left their own more discreet impressions on it. Click here to stay at a hotel located in the Alhambra gardens or within walking distance of this magnificent attraction, offering guided tours and much more! During the 18th century and part of the 19th, the Alhambra fell into neglect and was to see its salons converted into dungheaps and taverns,occupied by thieves and beggars. "Thus bats defile abandoned castles, and the reality of Spanish criminals and beggars destroy the illusion of this fairy palace of the Moors;" writes Richard Ford. As the crowning blow, Napoleon's troops, masters of Granada from 1808 until 1812, were to convert the palaces into barracks During one retreat they mined the towers and blew up part of them. Two of them, the Torre de Siete Suelos and the Torre de Agua were left in ruins. 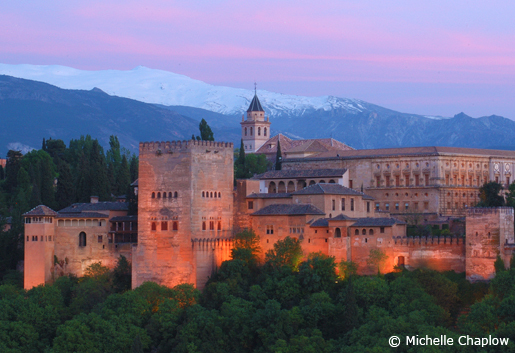 And so the incredible neglect continued, until 1870 when the Alhambra was declared a national monument. Travellers and romantic artists of all countries had railed against those who scorned the most beautiful of their monuments. Since that date and up to now, the Alhambra, protected, restored, cared for and even improved, has been preserved for the pleasure and admiration of all.The Alhambra became an UNESCO World Heritages site in 1984.